Item is lightly used and has been tested to confirm correct operation. It is switchable between 115V and 230V - unit ships set to 115V. No printed manual is included but a copy may be downloaded here if required. The RB-SM2 is a dual version of the RB-SM1, consisting of two independent converters which will produce two fully buffered and balanced mono line outputs from two stereo inputs. All connections are on the rear panel. The XLR-3 inputs are electronically balanced with an impedance of 20k? bridging. These can be wired unbalanced to accept an output from domestic equipment. 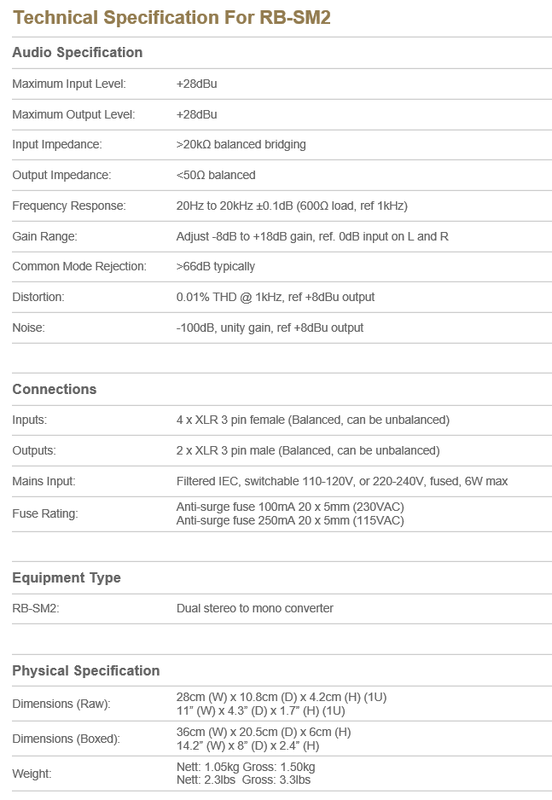 The XLR-3 line outputs are electronically balanced with an output impedance of <50?. The outputs can be wired unbalanced by grounding the non-phase signal, allowing you to feed both balanced and unbalanced equipment. Output gain adjustment using pre-set potentiometers for both converters allows a normalised mono output from domestic stereo equipment. The potentiometers are accessible through the rear panel.